Pound 4 Pound Boxing Report Podcast #87 – Cotto Easily Dispatches Geale, Bring on Canelo!!! – We discuss Miguel Cotto’s stoppage over Daniel Geale, his upcoming fight against “Canelo” Alvarez, and the issue of catchweights. – Robert Guerrero struggles en route to a split decision win over Aron Martinez. Is “The Ghost” on decline? – Just how good is American Heavyweight prospect Dominic Breazeale? – IBF Jr. Featherweight champion Carl Frampton is headed to the U.S. to make his next title defense. – Negotiations are happening for a fight between newly crowned IBF Super Middleweight champ James Degale and Bernard Hopkins. – David Lemieux’s exciting stoppage win over Gabriel Rosado. We discuss the improvement of Lemieux and he really good enough to challenge Gennady Golovkin?. 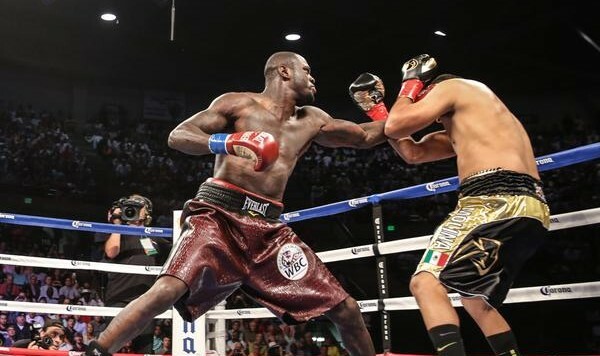 – Hugo Centeno Jr. destroys James De La Rosa on the on the undercard of Lemieux – Rosado. Is Centento Jr. really as good as he looked against De La Rosa. – Thomas Dulorme defeats Hank Lundy by split decision. Was this fight more about what Dulorme did, or what Lundy didn’t do? – The strange ending to Jean Pascal’s No Contest over Roberto Bolonti. – The ongoing discussions for a possible May 2015 showdown between Miguel Cotto and Canelo Alvarez. In the lead up to Miguel Cotto’s fight against reigning WBC Middleweight Champion Sergio Martinez, Cotto was considered my many (your truly included) to be the underdog. He was he smaller man moving up in weight and many wondered if he had enough to get to the quick and elusive Martinez. Well, in the sweetest victory and possibly the best performance of his career, Miguel Cotto moved up to Middleweight and stopped Sergio Martinez in ten to win the WBC Middleweight Title last night in front of over 21, 000 screaming fans at Madison Square Garden in New York City. With this win, Cotto became the first Puerto Rican boxer to a world title in four separate divisions. Simply put, this was a dominant and emphatic victory by Cotto as he dominated from the start and never let Martinez off the hook in this fight. Starting fast and looking very sharp, Cotto struck early in round one as he buckled the legs of Martinez with a left hook one minute in round one, and subsequently knocked him down with a follow-up hook. Cotto knocked Martinez down twice more in the first round and at that point, the fight was basically over as Martinez never recovered from the blistering round one from Cotto. From then on Cotto fought with a calm and cool precision, slowly but surely breaking Martinez down. It wasn’t just a case of Cotto landing his vaunted left hook, Miguel Cotto (39-4, 32 KOs) was spry on his feet, showing side to side movement and an elusiveness that you haven’t seen from him in years. He did it all, out-boxing Martinez and out-fight Cotto on the inside as well and hurting Sergio Martinez anytime he landed with a solid shot. The power of Cotto showed itself again in round four as he wobbled Martinez once again with a left hook Martinez and dominated the round. Martinez (51-3-2, 28 KOs) fought back hard in round five, but it wasn’t nearly enough. Cotto quickly gained control in round six as he worked effectively to the head and body of Martinez, including a vicious right hand to the body towards the end of the round that Martinez clearly felt. Round seven and eight saw Cotto turn boxer as he moved around the ring, using angles, popping jabs and landing combinations up and down on Martinez. At this point, Cotto was fighting with full confidence and was in total control. In round nine Cotto hurt Martinez again, this time courtesy of a right hand and a wicked left uppercut. Martinez was battered in this round and Cotto was credited with a knockdown towards the end of the round. Thank goodness, the corner of Martinez saved the fighter from himself as his trainer Pablo Sarmiento refuse to let his fighter come out for round ten. This was a dominant win by Miguel Cotto and arguably the performance of the year so far in 2014. Afterwards Miguel Cotto said this was the “happiest day of my life, this is the biggest achievement of my professional career.” Coming into the fight there were lingering questions about Sergio Martinez and the condition of his knees as a result of knee surgeries following fights with Julio Cesar Chavez Jr. in Sept. 2012 and Martin Murray in April 2013, Sergio Martinez didn’t look strong and sturdy and was vulnerable throughout the night. Given how he looked last night, retirement should be a serious option and at this point and it doesn’t look as if Sergio Martinez would do well against any of the top fighters at either Middleweight or Jr. Middleweight. However, that shouldn’t take away from the mastery that Cotto displayed. You have to understand that Cotto started his career at Jr. Welterweight (140lbs). After all the successes and triumphs of his career, after all the tough fights, Miguel Cotto moved up to Middleweight and put on an exemplary performance whipping the lineal Middleweight champion of the world. This was Miguel Cotto’s night and he put on the fight of a lifetime that no one who saw it will forget. Now the question what’s in the future for Cotto? Like Carl Froch at Super Middleweight coming off of his KO in his rematch over George Groves last week, the world is at his oyster with big fights all over the place. There seems to be three big options for Cotto. One is a fight with the winner of the upcoming July 12 bout between “Canelo” Alvarez and Erislandy Lara. A second option would be a Middleweight unification bout against WBA champ Gennady Golovkin. A third option is a rematch with Welterweight champion Floyd Mayweather. All three of those fights would be big (especially a fight with Alvarez or a rematch against Mayweather) fights for big money. However, that’s in the future. 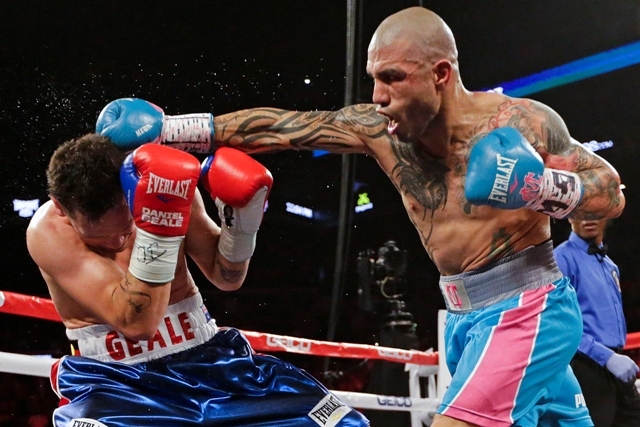 For now, lets bask in and admire what Miguel Cotto did last night. He put on a career best performance and show how great of a fight he truly his.